Our Easter holidays in April of 2008 was the right time to visit the Vinag wine cellar in the center of Maribor known as one of the biggest in classical wine cellars in Europe. 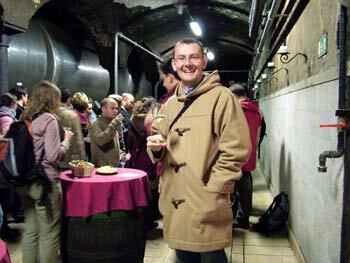 It was a cold and rainy day - perfect for something indoor so we decided to visit the cellar. After all we haven't been there before at all! 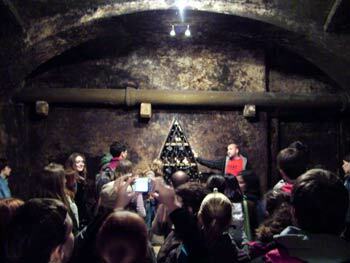 We joined a group of some 40+ foreign students so you can imagine the buzz when they announced a series of wine tasting to follow the cellar tour. Well, we were indoor but far from warmth you'd expect. 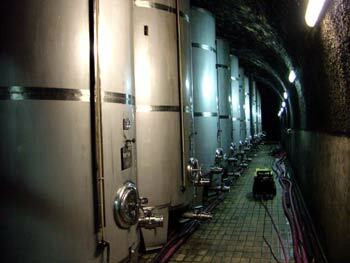 The constant temperature in the wine cellar of 9-10C and roughly 90% humidity make you feel really cold. However, these conditions are really important for the quality of wine because only in these conditions wine can ferment and mature. We were guided from one tunnel to another and after a while we felt completely lost. The whole cellar is like a small town with streets, its own workshop, etc. The tunnels represent streets and the oak barrels and modern tanks represent the houses. 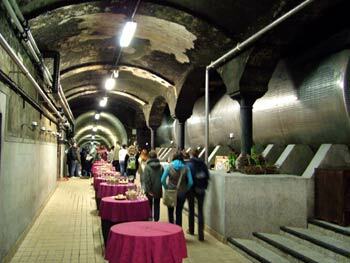 There are almost 3 km of tunnels and about 140 wooden barrels and modern tanks and each of them can tell its own story. The wine cellar is really big. I don't know about you but to me 20,000 square meters and a capacity of 5.5 million liters of wine sounds like an awful lot. 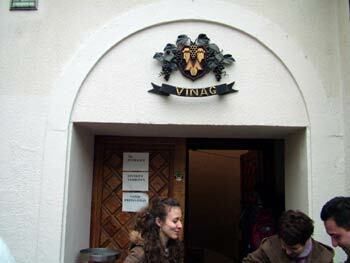 The humble entrance to Vinag wine cellar in Maribor. One of many tunnels with oak barrels. Well, the barrels are somehow big, don't you think? 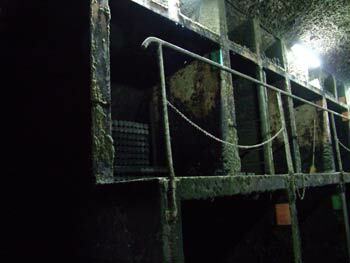 Another tunnel with modern tanks. The archive in the cellar is a hidden pride of the city. Vinag's archive has enough room for 400.000 bottles but at the moment just about 250.000 bottles of the best vintages are kept. This is the only archive in Slovenia that has samples of all post-World War II vintages. 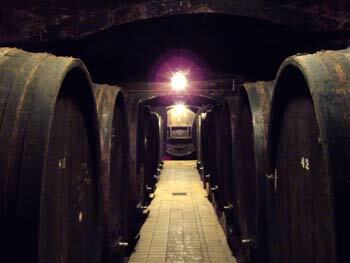 The oldest wine there is the Wellschriesling (Italian Rizling), late harvest, year 1946. I was really surprised that they don't keep much older wine, but the main reason for that German soldiers who emptied all the bottles up during the Second World War. 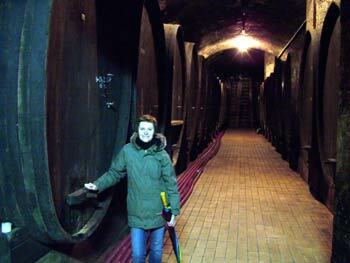 This is also the place place where the wine from the world's oldest vine is safely stored for world leaders and alike. ...some of the oldest wines in Slovenia. After walking for about half an hour or so we finally arrived to the wine tasting tunnel. The wooden barrels were used like tables with plenty of bread and cheese waiting for us. Students in particular were at most happy to say the least, although my husband showed equally child-like excitement. We started our wine tasting with a dry Chardonnay. It's got dry and very rich body. Its color is greenish-yellow. If I am honest, I don't like dry wines but this one was a pleasant surprise. the annual Christmas concert is held. Look at my husband's face. He looks so happy. The next wine was the semi-dry Foxy wine. This wine is a popular combination of excellent white sorts, ripening on Vinag's best and famous vineyards around Maribor. White Riesling, Traminer and Yellow Muscatel are combined into an excellent semi-dry wine. It's color is dark yellow and it tastes really rich. I really enjoyed this one. We finished our wine tasting with semi-sweet Yellow Muscatel. This is one of the oldest vines cultivated and was even highly appreciated by pharaohs. In Slovenia this wine has a long tradition as a superb-quality wine. I can say that this wine with a rich yellow colour and unmistakable muscatel aroma is certainty a number one choice for me. When we finished wine tasting I thought, ok that's it, but no, we didn't go home. 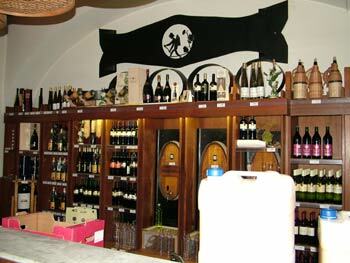 The next station was The Vinag's wine shop where my normally shopping-averse husband turned into a real shoppaholic. The prices of top class wines are really ridiculous. You can purchase a bottle of top quality wine for less than $10 or €6. we had to buy "a few" bottles. What can I say after such a great afternoon in the Vinag's wine cellar? It is certainty worth visiting. It is a great experience to see where the wines ferment and mature until the bottle is ready to be drunk. The whole experience kind of gives you an appreciation of the efforts involved to produce the precious liquid. Will we visit again? No doubt, wine tasting is definitely something you need to repeat every so often. Prices for visiting the wine cellar (per person) depend on how many people there are in a group. The larger the group the cheaper it is.